One of rarest and most beautiful of the gemstones is ametrine, a bi-color combination of amethyst and citrine quartz. Read some interesting facts about the history and lore of ametrine, courtesy of the Gemological Institute of America. People have used quartz in jewelry for thousands of years. When quartz displays the colors of amethyst and citrine in a single gem, the material is called ametrine or amethyst-citrine. The contrasting colors give it an intriguing appearance, and because the color zoning effect is natural, no two ametrines will ever be exactly the same. 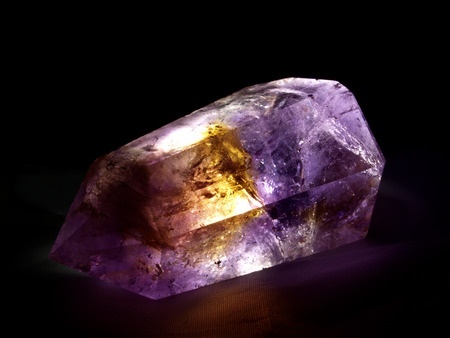 Fine ametrine shows medium dark to moderately strong orange, and vivid to strong purple or violetish purple. Larger gems, usually those over five carats, tend to show the most intensely saturated hues. Ametrine is popular among artistic gem cutters and carvers who play with the colors, creating landscapes in the stone. Cutters sometimes fashion ametrines as mixed cuts or brilliant cuts and use internal reflections to mingle the amethyst and citrine colors. Ametrine is also popular in free-form or fantasy cuts. Ametrine is often cut as a rectangular step cut because this style nicely displays the bi-color effect. Dealers look for an attractive half-and-half distribution of each color, with a sharp boundary between the two colors at the center of the fashioned gemstone. Ametrine’s only commercial source is the Anahi mine in Bolivia, a deposit in eastern Bolivia, close to the Brazilian border. Legend has it that a Spanish conquistador discovered the mine’s location in the 1600s and introduced the gem to Europeans when he presented several specimens to his queen. The mine had been given to him as a dowry when he married a native princess named Anahi. After that, the mine was lost for more than three centuries. Rediscovered in the 1960s, the mine’s ametrine began appearing on the market again during the 1970s. Today the mine, named Anahi for the legendary princess, also produces natural amethyst and citrine. The Anahi mine area is remote. Travel to and from the mine is limited to a flight in a small airplane or by a combination of roads and boats. Supplies and mine production move by boat. Knowing this, it’s understandable that the mine’s location was lost for centuries, and today ametrine is one of the rarest and most beautiful of all quartz gemstones. Some people believe that ametrine, like other gems, contains special healing powers. It is said that ametrine is very helpful in treating depression and promoting inner peace and tranquility. Some believe that since it contains the powers of amethyst and citrine in one stone, it is a very powerful money stone as well as an excellent conduit to higher psychic awareness and spiritual enlightenment.